Now it is common I paint something I never painted before when I demo for the workshop. I had a lot of fun painting that oil coffee grander, which is my first time painting it. I am a way behind. Before I went to Tucson, I was in Pennsylvania and did quite a few paintings there. This one was my first demo painting on the Williamport workshop. I want thank Bibi Brion for organizing my workshop, and thank all the artists for attending. We had a few snowy days, but inside the Pajama Factory was warm and happy. I saw so many old props, felt like in an antique show. I had a delicious feeling when I paint this one. "Plein Air Painting at Tucson 3"
This is my third plein air piece at Tucson. On the fourth day of the convention, we went to the Old Tucson. I feel a little better than my previous one. The light and shadow is more obvious. I can handle it better. However, my feel is not strong. How to get a strong feeling in front of the scene is not easy. I have more feeling when I setup my still lives, but for landscape I have not got there yet. Need more learning. "Plein Air Painting at Tucson 2"
I use my blog to document my painting activities including successful ones and failed ones. My today's post is about a failure. On the second day of the Plein Air Convention, we painted at the Catalina State Park, where has beautiful scenes of mountains and saguaros. I was overwhelmed by what I saw, and having a hard time to decide what to paint. The light changed quickly, and finally I find a piled of ruck with cactus with a back light. The shadow colors were beautiful, so I decided to give a try. I was rushed for about 30 minutes, then the light was gone. I barely got some value and no time to think about colors at all. That was I had. How do you like it? 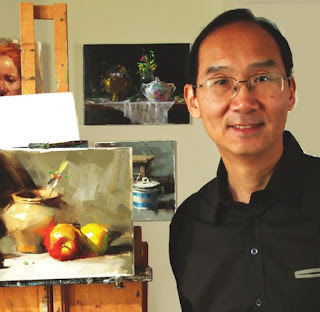 From April 15 to 19, I have attended the Plein Air Convention at Tucson, AZ. It was a wonderful event. I met many wonderful artists and so happy of seeing many old friends. This one is a plein air piece I did. I admire so many great artists having the ability of painting mountains and saguaros, because I can't. So I hid in a place not many people can see me and painted this wagon. Demo three: painting flowers. When I set up the still life, that flower was rather small, but it grew so fast. During the demo, it got so big making my composition off the balance. I really like the second demo I did. My color presentation gets more impressionistic now. Colors do not need to "belong to" any physical objects. I concern more how to make the painting better rather than to make the scene realistic. BTW I am at Williamsport, PA now and started another workshop teaching. This is my demo 1 on my Sacramento workshop. However, what I want to say today is that this painting was done about two weeks ago. Life has successfully stopped me from painting for about two weeks now. I must admit that I have lost the battle this time. Like most of people on this world, I was sooooo busy. This busy-ness has driven me nuts. Painting? who care about that? I have been doing "important" things. Being busy is a very dangerous disease. The Chinese character for "busy" has two parts: the left means "heart" and the right means "death". So if you are too busy, your heart will die. If you feel no way out of those "important" things, you want to be alert now. This world will turn you into a zombie. I want to thank Patris Miller for organizing this workshop and thanks all the California artists for coming and paint with me. Finally, The downloadable version of my DVD is ready for purchasing. Please visit the DVD page of my website. Now you may either purchase a physical DVD or download the video onto your computer or iPad. The size of the video is about 1.1 GB. Please make sure you have enough space on your devices. If you have any issues please let me know. I will learn and try my best to help you. I have never thought I am going this far in my art career. 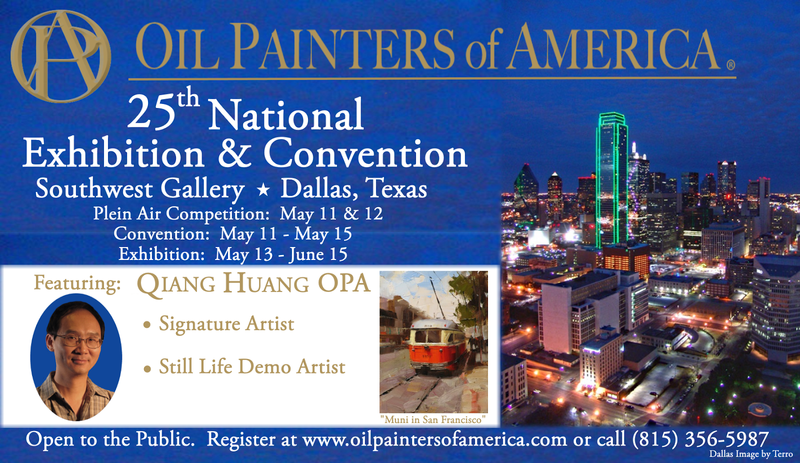 I am extremely honored to be the demo artist for the 25th National Exhibition and Convention of the Oil Painters of America. Meanwhile I am extremely humbled. So many my teachers will be watching I paint on the stage. I will be nervous for sure, like a student presenting homework project in front of a group of professors, wondering if I am able to pass the test. I will be very honest to tell you that I don't know much in painting, but I will definitely try my best to show my painting process. I hope it will benefit to the OPA Convention participants to know how I work. 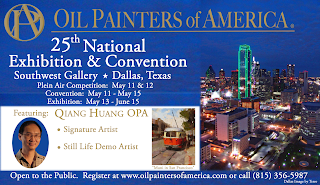 I am looking forward to meeting or seeing you in Dallas.